With community support, Flanders Park is in the process of being transformed into an inviting outdoor performance area including numerous enhancements to the existing park. The designs have been finalized to include a spectacular performance bandshell with terraced hillside amphitheater seating. Professional landscaping in the park will include a rain garden to help with drainage from the bandshell and amphitheater, a stone plaza between the seating and bandshell, tree plantings, gateway structures, and more. In addition, if sufficient funding can be secured, the Waterfront Walkway will be extended along Raquette Pond and up to the Cliff Avenue connection. Architectural renderings of the performance bandshell for Flanders Park (Andrew Chary design). Our vision for this new performance park covers a broad range of events. It will be a place for concerts featuring live musicians and bands, as well as theatrical performances such as "Shakespeare in the Park." In addition, it will play host to a variety of events, entertainment acts, educational workshops, and farmers' markets -- all set to the backdrop of the one of most beautiful sunset vistas in the Adirondacks. The next phase of this project will be to create a sustainable plan for this park use. At the Oct. 18 board meeting, the village revealed that the concrete foundation would soon be poured. Local excavating companies have volunteered their time and resources. 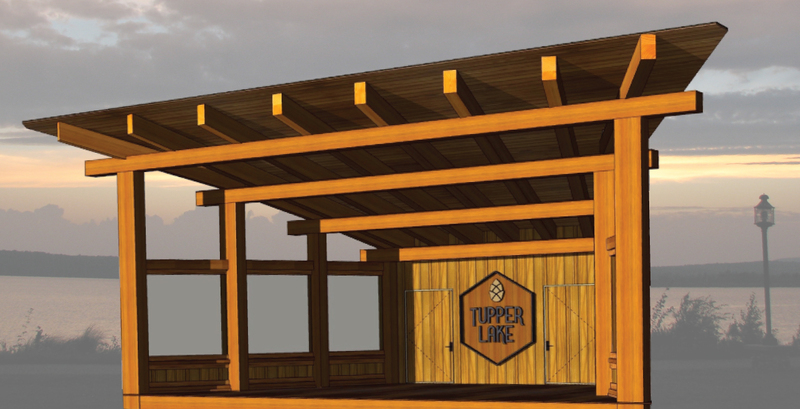 Overall, $40,000 has been raised by the Tupper Lake Lions Club, and more than $10,000 raised through crowdfunding will supplement a Local Waterfront Revitalization grant from the Department of State. The bandshell will be constructed off site, and shipped in after the foundation is poured. Construction is currently underway, with the bandshell being delivered Mid-May. Updated Flanders Performance Park renderings courtesy of Terrain-NYC Landscape Architecture PC. Tuesday July 3rd - Tupper Celebrates the 4th! 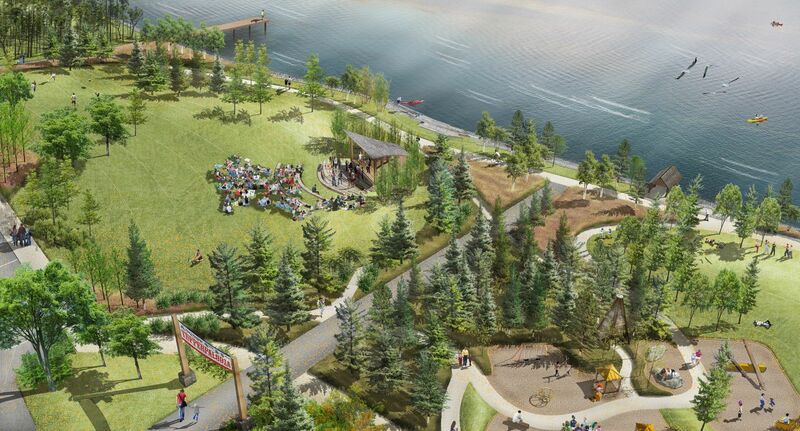 Flanders Performance Park is one phase in the multi-year implementation of Tupper Lake's Waterfront Park Master Plan. This project has been generously supported through the New York State Department of State Local Waterfront Revitalization Program. Every dollar donated during this capital raising campaign will potentially help to leverage an additional dollar in grant funding for future park improvement. To view the entire Master Plan and learn more about how Flanders Performance Park fits into the larger picture, please visit the link below.